If you missed part 1 here it is. In this post I’ll talk about the less obvious benefits deadlifting will have on your swing. 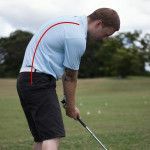 In the setup for a golf swing, the spine should be relatively straight. However, many people have one of two common problems here. Neutral – Spine is straight. S-Posture is a large anterior (forward) pelvic tilt causing excessive curvature of the lumbar (lower) spine. This is the most common problem. C-Posture is an excessive curvature of the thoracic (upper) spine which causes rounding in the lumbar spine. 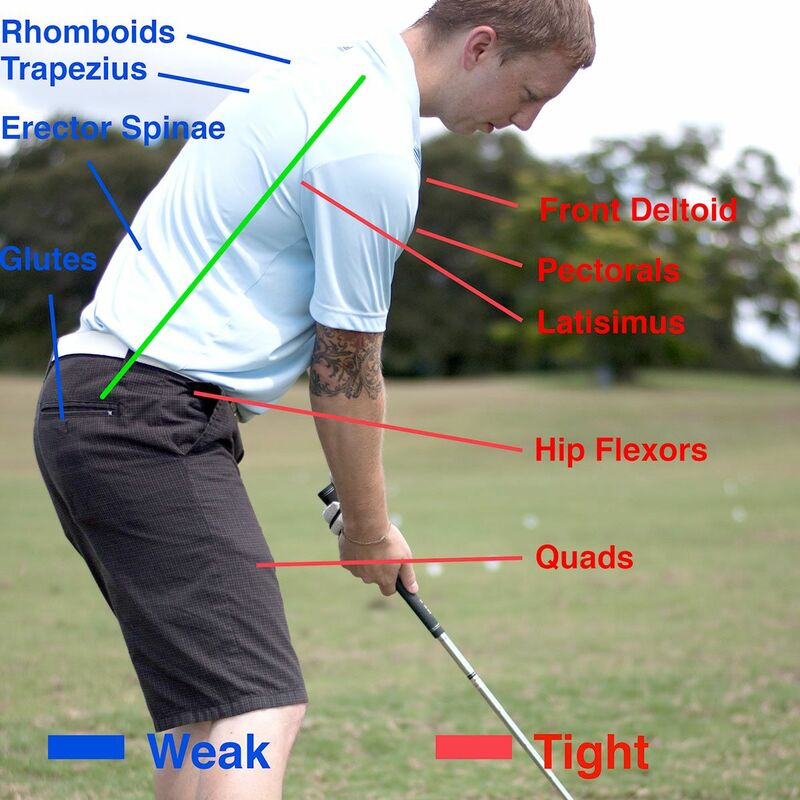 These postural distortions are actually extremely common in our sedentary culture and are not limited to golfers. 65% of players lose their posture. Even though these curvatures look very opposite they actually have very similar causes. In the case of S-Posture the hip flexors and quadriceps are very tight and short, and the glutes are inactive, causing that big pelvic tilt. In the C-Posture the pectorals, shoulders, and cervical flexors are extremely tight and short, and the rhomboids, trapezius, and erector spinae are long and inactive. This causes the upper spine to round and the head to migrate forward. In the C-Posture the quadriceps are also overactive, and the glutes are inactive. Any compensations at address will lead to restricted mobility in your spine (lack of upper and/or lower body rotation). 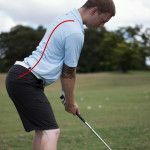 A straight spine rotates more easily, predictably, and consistently than a curved one, leading to increased consistency. The good news is that deadlifting fixes the root causes of both of these common postural compensations! If you look closely, you’ll see that in both cases the anterior side of the body is short and tight, and the posterior chain, along with the core stabilizers, are inactive. Deadlifting is a complete posterior chain exercise which also trains spinal stability. Deadlifting activates and strengthens the hamstrings, glutes, low back, upper back, rear shoulder, spinal stabilizers, and shoulder stabilizers. Deadlifting also trains the glute medius, your primary hip stabilizer, which will increase lower body stability in your swing and prevent swaying away from the ball and sliding through it. The glute medius will also help create a more stable base for putting and chipping. Any postural compensations (as we discussed above), or movement dysfunction, will cause injury over time. This risk is greater when compounded with the extremely violent and asymmetrical movements found in golf. 60% of professionals and 40% of amateurs experience a golf related injury every year. The most common areas of injury are low back, wrist, shoulder, elbow, and hip. Deadlifting helps correct many of the common movement dysfunctions that cause injuries in golfers. 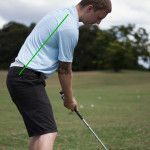 The golf swing puts the shoulders and chest in a constantly protracted and rounded position. Over time, this prevents full shoulder range of motion leading to further compensations and ultimately shoulder instability and pain. Deadlifting trains shoulder retraction and depression which counteracts persistent compensations from being in golf posture. This keeps the shoulder complex stable and in balance. Deadlifting can also prevent or improve low back and knee pain, since much of low back and knee pain stems from an imbalance in the muscles surrounding the hips, and deadlifting helps correct this imbalance. This short exchange told me all I needed to know about his knee pain. His problem wasn’t actually in his knees. Since he had not been working out, his glutes were shutting off and he was reverting back to his quad-dominant state. When the quads are overactive, more pressure is shifted forward and onto the toes. This was not only causing increased pressure and pain in the front of his knees, it was also causing him to early extend and miss more often. Deadlifting helps re-engage the glutes and take pressure off the quads and knees, which prevents knee pain. Deadlifting also helps strengthen the grip and wrists preventing much of the injuries common in the wrists and elbows. Read on to part 3 in the series.